I am sorry if this has been asked before but I have searched the forum and cannot find an answer for this. I have been happily using AP for several months and learning lots, and have now got to a stage where I am finalising several bits of work. When I work in Photoshop before going further I would go to File Info and then add the image info such as title, description, relevant searchable keywords, and then add all my copyright info and my url, so once it goes out my image has relevant metadata attached to it to help protect it and identify it should people need to contact me. I cannot find out how I do this ANYWHERE in AP and it is a basic but really critical element to the process. Please can someone advise me where and how I access the file info section for images so I can add this information. I have even converted AP images into jpegs etc and searched that way in case this option only becomes visible with more recognised file types but with no luck. I cannot believe a programme as smart as Affinity has not built this in, as in this day and age it is really important to protect your copyright and also allow your image to become searchable with key words. What sort of third party products, as I have not had to do this before so would not know how to start and then add it in? If you can advise what I should start looking for it would be appreciated. Will this be functionality that you are going to add in the future? It costs almost as much as an Affinity app but it does include batch processing, extensive Applescript support, etc. simpler and less powerful, i'd suggest "Exif Editor" from the apple store.it's very good when working on an image at a time and can handle a bunch of images, but it does not do batch afaik. nayway, it costs around 10$. if you feel geeky, you can use the super-powerful exiftool, freely downloadable from http://www.sno.phy.queensu.ca/~phil/exiftool/. with some shell or applescript scripting, it can be turned in a batch beast. i recently discovered that a graphical interface is available (at https://hvdwolf.github.io/pyExifToolGUI/) but i've never used it (yet) so i can't comment on it. Had the same issue, and found PDF Attributes on the App Store. 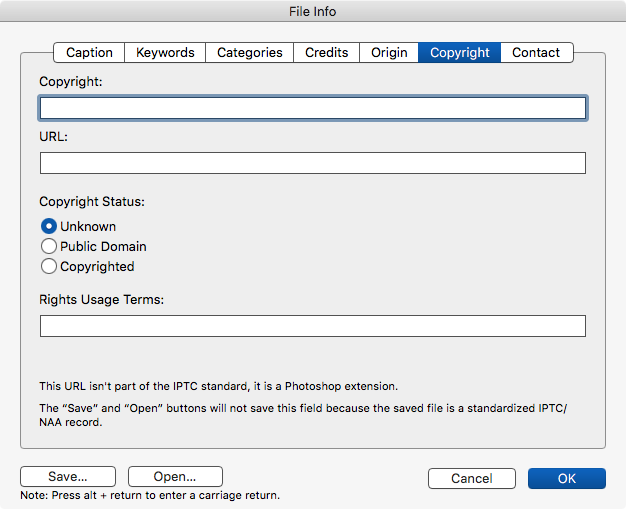 Free, and can edit certain fields other PDF metadata editors cannot. Thanks very much for your confirmation. I think that, unfortunately, the lack of metadata support will ultimately prove to be a deal breaker for Affinity Photo within my workflow. It'd sure be nice to know whether or not metadata support is even on Affinity.serif's radar. Can't imagine why it has been somehow overlooked to this point. As far as I know, the only kind of photo metadata Affinity Photo currently supports is displaying any existing embedded EXIF metadata (in the View > Studio > EXIF panel) plus adding to or editing only the EXIF Description field. 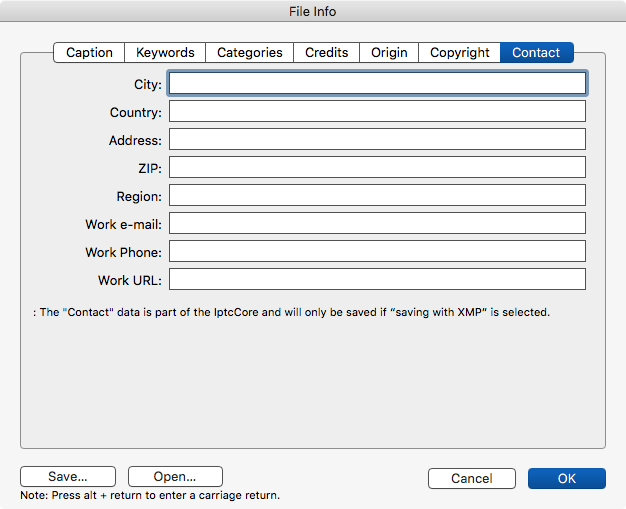 I think XMP, IPTC extensions, etc. are not supported at all, other than (maybe) displaying (but not editing) that metadata in the "Raw Data" display of the EXIF panel. Thanks for the in-depth description. Hopefully, Affinity will eventually consider metadata beyond the limited capability of display, only. Being able to add (and edit) Copyright info, a Copyright URL, specific Rights Use info, etc. is a key aspect of any workflow involving the potential for on-line posting of images. For now I guess I'll have to stick with Photoshop. There are $10 third party exif editors. Give those authors a couple of $. Problem solved, and Serif doesn't have to waste time re-inventing the wheel. AFAI remember when looking into the AP Win trial, there was already a version of Phil Harvey's "exiftool" included in the installed AP distribution. This one would at least allow from a command line to edit/write EXIF, IPTC, XMP ... data. - It can be easily used/accessed/automated via Windows powershell, Apple automation or other scripting environments for writing custom needed data into images. See "Related Utilities" for Windows and Mac OS X on the "exiftool" website. It would appear that Adobe Bridge is now available as a free download. This will allow metadata entry and editing, including presets. I use it as my fist port of call in my workflow to enter metadata before any editing. I think that be able to edit or at least add EXIF info to files should be treated as priority in Affinity Photo and Design. I suggest to add in Options a field to enter Copyright information that will be added to any new file you create. I second this request. It's an important feature to editing photos; simple steps to help ensure that someone doesn't steal your hard work is important, and shouldn't need a seperate (paid) program to do so. Editing or adding EXIF metadata won't do that because it is trivially easy for anyone to change or delete it. Agreed, but it helps for general public sharing online (think of the number of people who tend to share via Pinterest, etc). Any steps you can take to help people source the work can be advantageous.